I'm sure I'm not the only one who's gotten back a critique, gotten excited all the great feedback, and then had that moment when I had no clue what to do any of it. Since I shared some of my edit letter last week, I figured this week was a good time to share how I planned to tackle implementing those suggestions. This critique isn't about line edits, so that takes one level out right there. I don't have to worry about going through my file and correcting anything. That'll come a few passes from now. While that makes it a little easier, it also leaves me with the harder stuff to do. Plot revision. The first thing I'm doing is reading through my feedback again and finding the common threads. This will help me identify and determine any arcs (character, plot, or theme) that will need to be fleshed out overall. I bold and color code major arcs so I can easily see them and how they flow. NOTES ABOUT COLORS: I've found color coding things makes it a lot easier for me to differentiate between old stuff, notes, and new thoughts. When things are finished, I convert them to black. Next, I read my chapter by chapter outline. I like to keep an up-to-date breakdown of the book, about a paragraph for each chapter. Odds are my final outline isn't exactly up-to-date (we all know how that goes, right?) so I'll need to make sure it is before I start revising. Updating that also gives me a nice refresher of the novel. Luckily, I got chapter by chapter feedback, so I can easily compare the suggestions to the outline. In another color at the end of the paragraph, I make notes about what I want to do. If I can write a new summary of the planned chapter I will, but I won't be able to with every chapter yet. Some things will need some figuring out first. By now, I should have a pretty good idea of how the tweaked plot is going to unfold. I go back to the top and write out the new summary for every chapter. This is at the end of the notes, and in yet another color. Side note: Sometimes I'll write out a new synopsis in a general "free thought" style to get my ideas in order, then start plugging them back into the outline. I've found telling the story on paper helps me see the narrative flow and lets the important items rise to the mental surface and show up in the summary. 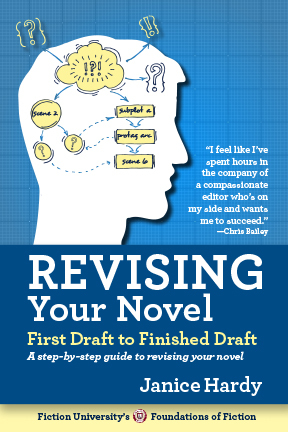 The goal is to get the new plot flow into your head so you can better direct the revisions. I usually start with anything I need to cut. Since I know I want to condense the first eight chapters to three or four, cut out a character and eliminate the subplots associated with that character, I have a lot of chopping to do. I cut first, because that gives me a good sense of how many words I'll need to reconstruct each chapter. I can easily see if a newly shortened scene will fit well in a different chapter or if I need to come up with new material. With luck, once I trim the fat, the remaining scenes will condense nicely and only need some smoothing over and continuity tweaks. I'll put the scenes in order how I want them. At this stage, I don't care if they don't "match up," as in, the ending of one scene doesn't transition smoothly into the next. This pass is all about getting the scenes where they need to go. It varies how much of the book I'll do this to, but most times I'll cut up the entire book so I have a solid structure of what I want. It might be choppy, and have holes, and some chapters might only be a few hundred words long, but I can see the overall book now. The pieces are in place and it's time to start filling things in. You must have noticed by now that notes are a vital part of my revision process. I might let the words go where they may as I write a first draft, but when revising, I like to keep the reins tight. This is no time to let the story wander off willy nilly, or adding a whole new plot line (it happens). If the prefect subplot comes up, of course I'll take it seriously, but the goal isn't to write a new book. It's to work on the story at hand. By now I have tons of notes, chapter-by-chapter summaries, and an overall summary of the full story. I know how the scenes unfold and what I need to do to start weaving things together again. I'll take it one chapter at a time, and then one section at a time. For example, I'll work on Act One until I'm pretty happy with it, then move on to the first half of Act Two leading up to the Mid-Point Reversal. Then I'll do the back half of Act Two, then Act Three, the the Climax and Wrap Up. I like to polish up chunks at a time because that way I know where my characters are emotionally and mentally before the next chunk. I can make sure that the plot lines, hints and groundwork are all where they need to be moving forward. It also allows me to get into the "new" story so I'm better immersed for the next section. I remember better what I just wrote, and not what I'd written. Once the book is done, then I go back and read my feedback one more time to make sure I've done what was needed and didn't forget anything. I fix anything that got missed, then I read the book again from start to finish, tweaking as I go. If I have time, I like to let the book sit for a month so I can forget what was supposed to be there and read it again to see what's actually there. But I don't always have the luxury of this if I'm on deadline. (Like now). Luckily, I'll have time away while my editor does the next read, and when I make the next set of edits I can fix any "revision smudge" as I like to call it. Those things that get left behind between edits. 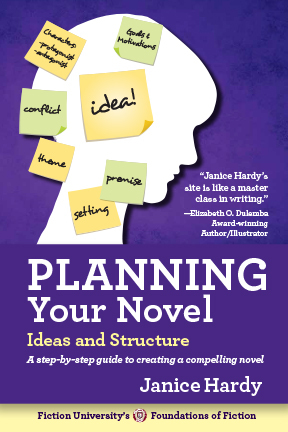 This plan won't work for everyone, and I imagine it would send pantsers screaming from the room, but if you like structure and like to work with a plan, this could help you keep your revisions organized. It's probably not as bad as I'm picturing in my head, but that sounds daunting! Good luck with your revisions! It's sounds worse than it is :) A lot of it is just brainstorming on paper before I do the actual writing. I can't imagine you struggling with plot. I was too busy to read this at work today. I'm glad I waited. I use a chapter outline too, but you've given me so many cool ideas to use as I revise, which I do often. Hope your revisions go well. Hey Janice! I haven't had any posts from you pop up in my RSS feeder (Google Reader) in awhile, so I came by the site today to check. Sure enough, you have posted since the blog tour finished! Do you know if your RSS feed is working properly? Or maybe it's just a Google Reader thing? Anyway, glad to see you're still posting! Kelly: Yikes, thanks! I don't know how to check that, but I'll put my hubby on it and see what he can find out. I've been fiddling with the site lately, so it's possible I clicked the wrong button somewhere. Kelly, I reset a few things in the settings, so let me know if that fixes the problem. Problem solved! Tell hubby thanks.